"Nobody tells me that I'm a strong teacher”. "Tan taught at Morningside Elementary, a decent if unremarkable school with an intake of mainly poor students, many of whom struggled with English. Year after year, students were entering Tan’s class with below-average ability in maths and English, and leaving it with above-average scores. You might imagine that before the Los Angeles Times published its rankings, Tan would have already been celebrated for her ability by her peers – that her brilliance would be well-known to fellow teachers eager to learn her secrets. You would be wrong on all counts. When the Los Angeles Times sent a correspondent to interview Tan, they found her quietly carrying out her work, unheralded except by those who had taken her class and knew what a difference it had made to their lives. “Nobody tells me that I’m a strong teacher,” Tan told the reporter. She guessed that her colleagues thought her “strict, even mean”. On a recent evaluation, her headmaster noted she had been late to pick up her students from recess three times. It was as if Lionel Messi’s teammates considered him a useful midfielder who needed to work on his tackling." We just found the exact same thing in Uganda. Ark Education Partnerships Group came up with the idea of doing a ranking of Secondary Schools based on value-added (adjusting for student’s starting point) rather than the current system of just looking at test scores at the end of school, which tends to reward schools that are able to select the best students, rather than necessarily teach them the most. "Some of the 200 schools ranked best in the country yesterday, reacted to the news with shock and awe"
One of these surprise top-performing headteachers seems to have almost accidentally stumbled across a fundamental principle of modern education thinking, that all students can make progress if you teach to their level instead of focusing on just the brightest kids in the class. "Mr Rajab Nsubuga, the head teacher of Hope Boarding Secondary School Lutembe, off Entebbe Road, the best Secondary School in the country, also said the ranking shocked him, adding that the school works on a philosophy that every student is a learner only that they accommodate slow, average and fast learners at their school." Phil Elks and I wrote up a paper with the methodology here. 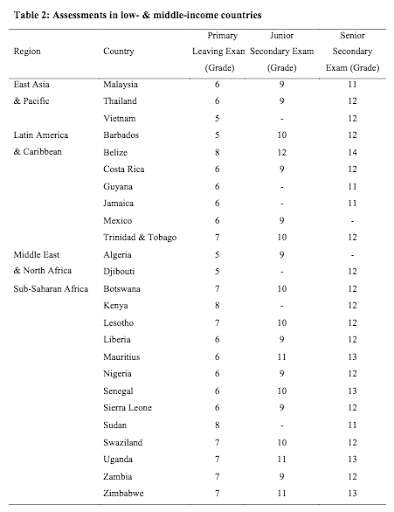 One thing in particular we note is that from a quick count we found at least 24 other countries that have official national primary and secondary exams that could be used for similar analysis. And for all the technical flaws of value-added models, they’re a pretty clear improvement on what currently happens, which is rankings of schools based on raw test scores.